Video about the project The Sound of the Netherlands. Sound of the Netherlands is a project of the Netherlands Institute for Sound and Vision, the Auditieve Dienst and Kennisland, which was supported by the digitization program Images for the Future. 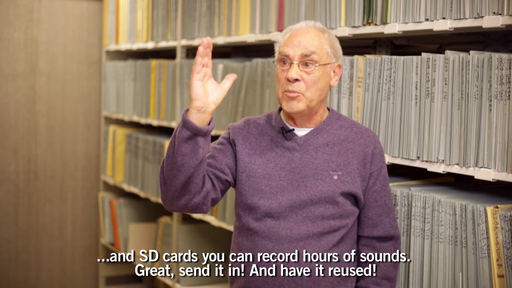 More than 2,000 of the historical sounds are so-called ‘own recordings’ from the sound archive of Sound and Vision, including many "lost sounds”, and are made online accessible to a wide audience. In addition, anyone can add sounds via the online platform or the ‘Sound Hunter-app’ for iPhone and Android devices. The collection of historical sounds and the new sounds are online available for consultation and reuse under the Creative Commons license Attribution-ShareAlike. To stimulate contributions to and reuse of the collection several events were organised, like workshops and contests. Sound of the Netherlands is made possible by a financial contribution from the Doen Foundation and the BankGiro Lottery. Direction, editing and audio: Sebastiaan ter Burg. This video was produced by the Netherlands Institute for Sound and Vision in collaboration with Kennisland and the Auditieve Dienst, as part of the large-scale digitisation project Images for the Future. The Netherlands Institute for Sound and Vision safeguards more than 800.000 hours of television, radio, music and film from 1898 to today, and collects, preserves and opens this audiovisual heritage for as many users as possible: media professionals, education, science and the general public. Kennisland works on social innovation, gives advice and develops solutions for the issues that crop up during the transformation to a stronger knowledge society. Arnoud Traa is a Dutch sound designer/recordist and composer with a fascination for vanished sounds. He works on film, theatre, installation art and games from his studio 'De Auditieve Dienst'. Sound and Vision and Kennisland are both partners in Images for the Future, a large-scale digitisation project in which four organisations have a large part of the audiovisual heritage of the Netherland through preservation and digitisation. The digitised materials are made as broadly available as possible for education and the general public.